Ah, the dryer sheet smoke deodorizer, that takes us back. Because here in the Seattle area, we feel lucky to live in the land of opportunity. After all, Washingtonians have better opportunities than most Americans — namely the opportunity to light up a sweet jay without fearing the long-arm of the law… much. But despite our above-average civil liberties, there’s still places where the dank smell of primo flower isn’t smiled upon…your hotel room or your dorm room, for example. Which is where the dryer sheet smoke deodorizer — we always called it a doob tube — comes in. With common household items, you can make a nifty device that will neatly deodorize your smoke and leave your room as fresh as a meadow of violets. Let’s make one thing very clear: here at your favorite Seattle pot shop we are not advocating illegal activities. We’re just sharing a trick that the considerate pot smoker can use to make sure that friends and neighbors aren’t offended by the wafting aroma of legal recreational marijuana. Plus it’s kind of fun to smoke into a cardboard tube. Fold a dryer sheet in half. Wrap folded dryer sheet around one end of cardboard roll and secure with tape or rubber band. Stuff 8-10 dryer sheets into roll. Light up your favorite recreational weed and exhale into tube. Having trouble visualizing this? Check out this short YouTube video on making a dryer sheet smoke deodorizer for weed. If you enjoy this experiment, you’ll probably need to restock. 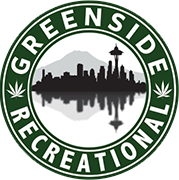 So swing by Greenside in Seattle or Des Moines and behold our fine selection of Seattle’s best weed — including cannabis wax, shatter, excellent pre-rolled joints, and all the dab supplies your heart might desire, plus other non-smelly stealth items like delicious pot brownies, delectable pot cookies, THC candies, and CBD topicals.